What is the Cool Touch Laser? The Cool Touch laser treatment is an exciting, innovative way to improve acne scarring, acne, wrinkles and other signs of aging. This non-invasive procedure stimulates collagen production to achieve smoother, healthier looking skin by using an infrared laser together with a cooling process to rejuvenate your skin from the inside out. The Cool Touch combines a cooling cryogen spray and a 1320nm Neodynium-YAG laser to give you optimal results with the least inconvenience. The protective cooling aerosol is sprayed onto the skin, prior to and after firing of the laser, thus allowing the Cool Touch laser light to pass harmlessly through the upper layers of your skin to shrink the sebaceous (oil) glands and stimulate cells (fibroblasts) that produce natural collagen. Collagen and elastin fibers continue to multiply after your treatment, and you will continue to see improved results in the months ahead. What are the potential benefits of this treatment? The most obvious benefit of the Cool Touch laser procedure is that it is a well tolerated, relatively painless treatment which results in the appearance of younger, smoother looking skin. There is immediate recovery with virtually no downtime and gradual, perceptible improvement over time. 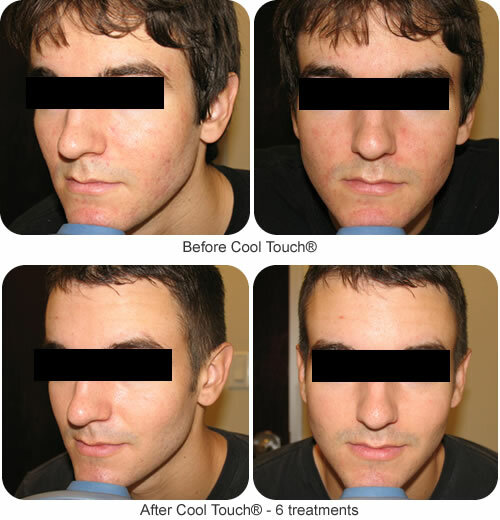 TheCool Touch laser treatment can be performed on many facial areas with minimal discomfort. A topical anesthetic cream is used prior to treatment. No injections are necessary. After a series ofCool Touch treatments, the skin tone will be better, the skin will be smoother, acne scars will be lessened, and wrinkling will improve. Additionally, patients notice fewer acne breakouts as a result of their treatments. What is the treatment like, how long does it take, and how many treatments are necessary? A pretreatment microdermabrasion will be performed prior to the laser treatment. After the microdermabrasion, a topical anesthetic is applied prior to the Cool Touch treatment. In total, the combined microdermabrasion and Cool Touch procedure takes approximately 60 minutes. After the procedure, you will experience mild redness and perhaps a bit of swelling that may last for one to three hours. Most patients report that they can resume their normal activities immediately after their treatment. Clinical studies suggest that three to six treatments are needed to stimulate new collagen growth. We also recommend regular touch up treatments to sustain the continued growth of new collagen. Can the Cool Touch laser be combined with other laser treatments? For patients who have acne scarring associated with facial redness or pink, red acne scars, the V-Beam (pulsed-dye) laser may be used in addition to the Cool Touch for superior results. As theCool Touch laser improves skin texture and acne, the V-Beam laser reduces the red component of scars to achieve smoother skin and a more even complexion. While we cannot guarantee results, most patients see significant improvement. In order to achieve the optimal outcome, multiple treatment sessions are necessary. Although the rare individual may be unresponsive to treatments, recent clinical research indicates the results of the Cool Touch are permanent and effective.